Trachycarpus is one of the most hardy palm trees you can get easily surviving past -10C so it is ideal for growing in the variable British climate! With its deep-green, tough, fan-shaped leaves producing wonderful shadows on your patio or lawn, this exotic beauty will be a brilliant centrepiece wherever you decide to plant it. It is slow-growing and compact ideal for a large patio pot, or alternatively you could plant it directly in the ground in a sunny spot. Simply cut off the leaves when they turn brown and over time, an upright, woody, fibrous trunk is formed. Supplied as an established potted plant, already approx. 60-70cm tall (including pot), Trachycarpus will grow around 5-10cm a year. 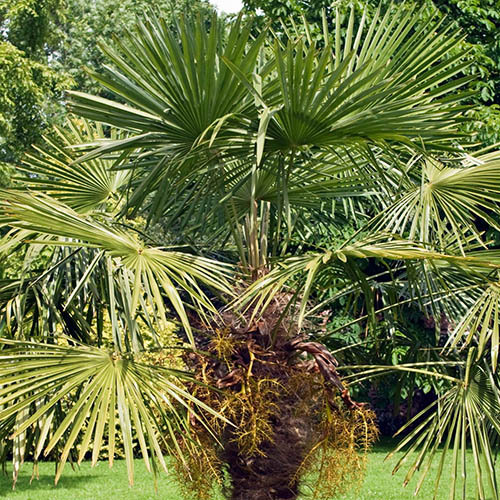 Also known as the Windmill Palm or Chusan Palm, Trachycarpus fortunei is evergreen and one of the hardiest palm trees you can get, easily surviving past -10ºC so it is ideal for growing in the variable British climate! This is your opportunity to get your hands on one of the hardiest palms that we have. with its deep-green, tough, fan-shaped leaves producing wonderful shadows on your patio or lawn when mature, this exotic beauty will be a brilliant centrepiece wherever you decide to plant it, bringing an exciting feel of the tropics to your garden. As well as being suitable for planting directly into your garden in a warm, sunny spot, Trachycarpus is ideal for a large patio pot as it’s compact and slow growing. This means that you can enjoy it regardless of the size of your garden, and if you move, you simply take it with you without worrying about losing your investment. Supplied as an established potted plant, approx. 60-70cm tall (including pot), Trachycarpus will grow around 5-10cm a year, ultimately reaching a height of 10m with a spread of around 1.5m. Winner of a prestigious RHS Award of Garden Merit, you can be guaranteed that this is a garden-worthy plant that has been trialled and tested for its suitability to grow in UK gardens. Supplied as an established potted plant, heights as shown including pot. Hardy to at least -10C. Grow in any well-drained, fertile soil in full sun or lightly dappled shade. Needs protection from strong or cold drying winds and will need protection from hard winter frosts by wrapping the leaves. If you live in an area prone to frost, you should consider growing Trachycarpus in a pot. Use a soil-based compost, such as John Innes No 2, with extra grit added to improve stability of the post and help drainage. Add controlled-release fertiliser granules to the pot or use a liquid feed every two week from mid-spring to late summer. Check plants and repot every two years in spring so that the soil does not become exhausted and stale.